Brownie Brittle : In 1992, Sheila G. Mains, better known in the food business as Sheila G, took a treasured family recipe for fudge brownies and baked her way into a thriving business. You may even have tasted one of her rich, dense squares of heaven at some of our nation’s finest restaurants and theme parks. So, where exactly did the inspiration for her scrumptious new snack brownie brittle come from? Like many brownie aficionados, Sheila is particularly fond of the crispy edges. In fact, on many an afternoon she would walk through the bakery gathering the brittle batter off the sides of the sheet pans as the brownies cooled in their racks. It had that same rich chocolate taste, but with an amazing crunch. That started her wondering: How could she create a whole pan of crunchy edges? Well, lucky for us, she figured it out! 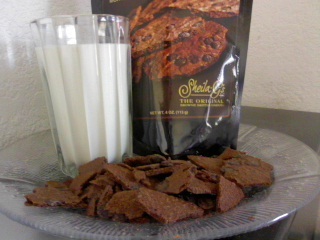 Now you too can satisfy your sweet tooth in a snap with Sheila G’s Brownie Brittle! (Read More). Peanut Butter Chip : I have to admit, I'm not a peanut butter fan. About the extent of peanut butter I like is Peanut butter cookies. Blah! on the rest of it. But I now have one more peanut butter item I can add to the list. Peanut Butter Chip Brownie Brittle. This stuff is amazing. It doesn't have that strong peanut butter after taste like most sweets do! The aroma when opening this bag I was alittle scared because it has a strong hint of peanut butter, But the chocolate brownie pairs nice with it. The brittle is packed full of big chunks of peanut butter chipsI was very pleased with the turn out of the flavor. When dipping the brownie brittle in a nice cold glass of milk, the brownie brittle didn't sog down like a cookie, it asorbed just enough cold milk to make it enjoyable. I love it! 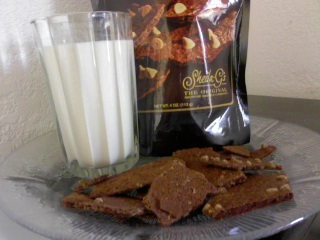 the Brownie Brittle is thin like brittle but has the amazing taste of brownie. Sheila G is on to something special!. Make sure you check out the giveaway! Nancy is giving me the opportunity to giveaway a 3 pack to one of my lucky readers! Chocolate Chip : I have been a chocolate Chip fanatic since I was a child for as long as I can remember. There is nothing better then a bitter sweet morsal of chocolate on chocolate. (Mmm) I loved, loved, loved. Chocolate Chip Brownie Brittle ! The chocolate chip had this amazing double chocolate crunch that I could eat all day! The bag is pretty much gone because My Husband and I chowed down on it with glasses of cold milk. We couldn't resit. It's a good thing I took a picture before he came home. If you have a chocolate fanatic in your family, or know someone who is they will love the Chocolate Chip! It's packed full of yummy chocolate chip goodness and surrounded in the crunchy goodness of brownie brittle. More Please!. 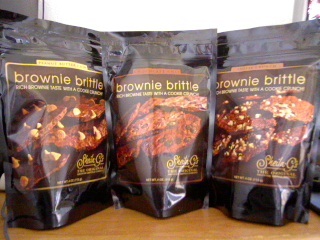 Look for the giveaway for the giveaway for your OWN Brownie Brittle! Toffee Crunch : I have to say..This is by far my favorite. I loved the peanut butter, and I loved the chocolate chip. But the Toffee Crunch Yum! I love Toffee. 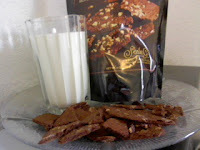 In my milk shakes, cookies, if i could I would eat just plain toffee. My brain tingled every time I ate the Toffee Crunch Brownie Brittle. Everyone has their favorites. This just happens to be mine! mine! ALL mine! okay, maybe not all of it. My husband helped me pig out on it. (This is his favorite too!) We enjoyed this one just like the other 2 over a nice cold glass of milk. it asorbed the cold milk but still had that crunch to it. but we couldn't help but to enjoy the sweetness of the Toffee. The aroma each time we opened the bag was like christmas morning over and over again. the sweetness of the chocolate and the aroma of the toffee but a smile on our face. The smell filled our bedroom and we could smell the brittle scent for awhile. It's better then air freshner. Maybe that's the next thing that Sheila G should produce. Brownie Brittle air freshner, maybe candles? I know I would stock up on those if I could make my home smell like Toffee Brownie Brittle. Be sure to check out the Giveaway that I will be having for one lucky Reader of mine! They will be getting their own amazingly delicious Toffee Crunch! . ♥ I received no monetary compensation for this review. I was provided Brownie Brittle to review, giveaway and give my honest opinion(s).